A funeral resolution is more detailed than an ordinary funeral invitation. For instance, the latter just states the time, date and venue of the funeral that is to take place. However, a funeral resolution will consist of a dedication, an obituary or even a eulogy. In simple terms, the funeral resolution adds a certain dignity and character to the event as a whole. Now to create this resolution can be a tough task. However, you can resort to these templates provided below. You can also see Funeral Template. This funeral resolution template comes in a light pink background with a beautiful pink floral pattern adorning the sides. 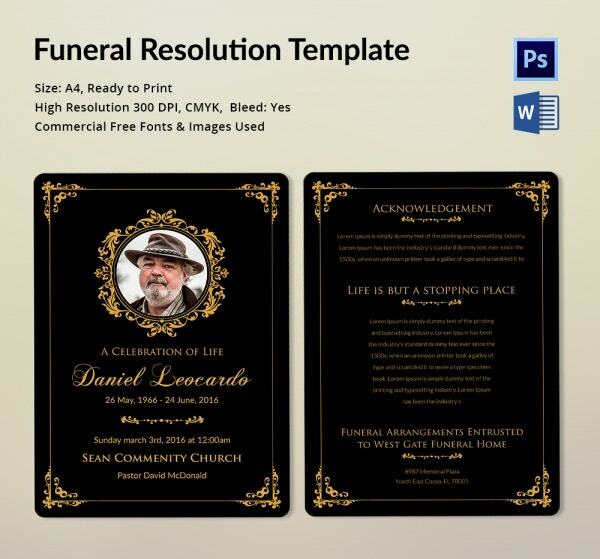 Also the funeral resolution template comes in an A4 size format. 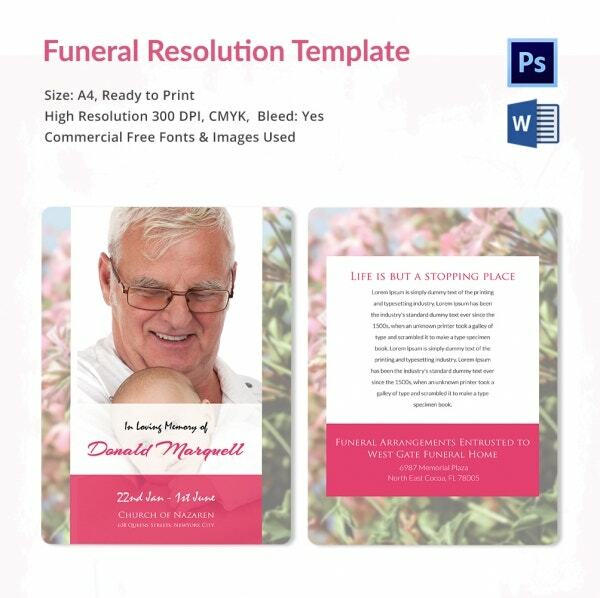 This funeral resolution template comes in an A4 size format that is all set for printing. Also, the template consists of a black background and a beautiful gold border adds to the charm. 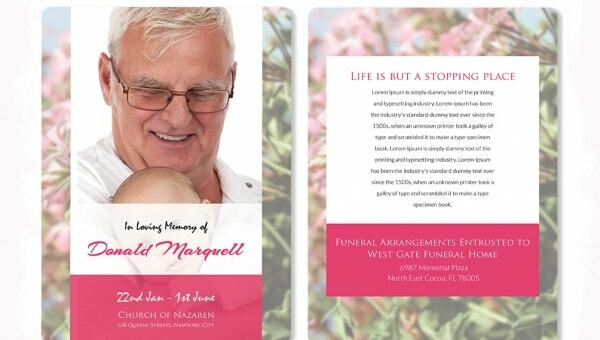 This funeral resolution template comes with a light cream background and a colourful pattern all over the template. Also, it is 100 % editable and customisable. You will be able to change the minute details. The colour white looks the classiest when it comes to special events like funerals. In this template, you will find a spot for an image where you can insert the picture of the deceased person. 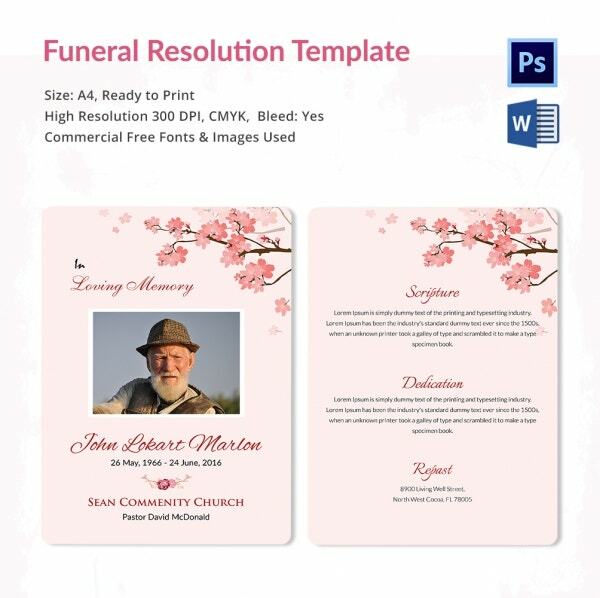 This funeral resolution template allows you to use both sides of the template. For instance, you can put the basic details and the image on one side and a dedication or a eulogy on the other. > What do the Funeral Resolution Templates Contain? 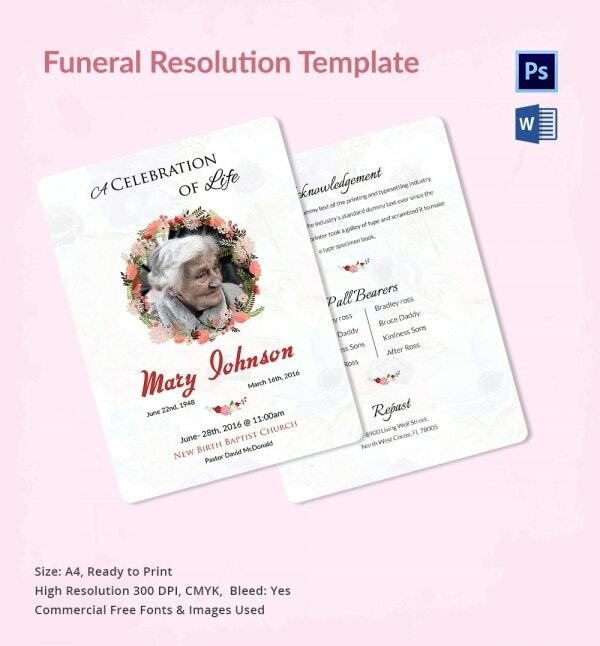 A funeral resolution template doesn’t just contain the details of the funeral about to take place. It is much more than that. A funeral resolution template usually contains two sides, each containing separate information. On one side, you have a catchy heading which immediately appeals to the eye. That is followed by an image of the deceased, which is usually surrounded by a border. You will also find the details of the event like the date, time and venue. On the other page, you will find some words about the deceased, a eulogy, a dedication or some details about his or her life. These templates have been developed by professionals who know exactly what an event like this requires. They are fully customisable and editable. Once you download the template, you can edit and customise the textual and graphic elements of the template. These templates come in a standard size and a print ready format. These templates come in a word format making them easy to use. They are also well designed, professional, elegant, lavish, appealing and charming to say the least. 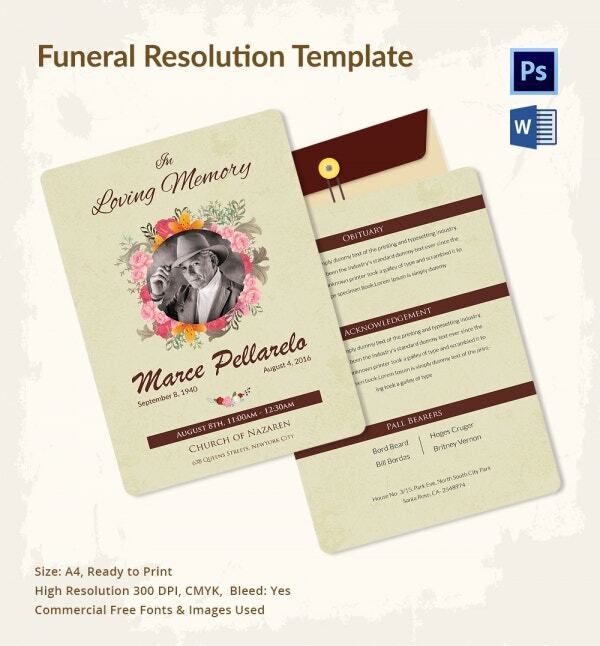 If you are planning a funeral for a loved one, then you really cannot afford to miss out on these funeral resolution templates. These templates would make your work ten times easier for you and would reduce your hassle as well. All you have to do is download them!